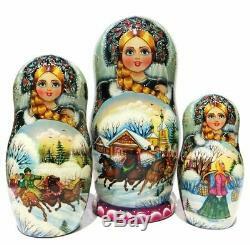 Maslenitsa Nesting Doll 7 Piece Set. 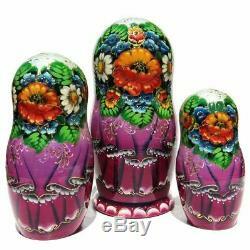 This is another great nesting doll that blends Russian culture into the nesting doll artwork. In this nesting doll, you can see that nothing can stop the villagers from celebrating Maslenitsa at the countryside fair. Maslenitsa is a spring festival that features traditional Russian pancakes and traditional Russian games and fun. 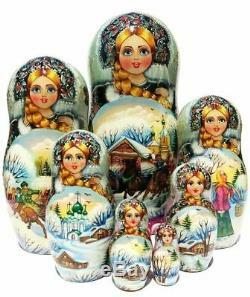 This unique nesting doll will touch someones heart as they see the remarkable artwork and Russian scenes in this 7 piece nesting doll. This exclusive quality set was hand painted in the best Russian tradition and it stands about 8 tall. These dolls also feature a great combination of warm spring colors and shimmering crisp paints. The extra fine details throughout make this babushka doll a very special one-of-a-kind masterpiece. The doll is painted all around on front and back; the back of the doll features gorgeous flower blooms outlined with embellished golden trim. Patterns and design elements vary since all dolls are hand painted. The quantities are very limited. This doll is also signed in Cyrillic on the bottom by the original Russian artist. Materials: lime wood, water based paint, lacquer. The largest nesting doll is about 8H. Listing and template services provided by inkFrog. The item "Maslenitsa 7 Piece Handmade Babushka Matryoshka Russian Nesting Stacking Doll" is in sale since Friday, September 14, 2018. This item is in the category "Dolls & Bears\Dolls\By Type\Nesting". The seller is "greatrussiangifts-1" and is located in Post Falls, Idaho.